Fidelis is the leader in automated detection and response. 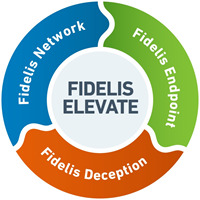 The Fidelis Elevate platform dramatically improves the effectiveness and efficiency of security operations by delivering comprehensive visibility, intelligent deception, alert validation, and automated response across network and endpoints. Fidelis is trusted by the most important brands in the world. See what you’ve been missing. For more information go to www.fidelissecurity.com. Modern attacks are constantly evolving to evade firewalls and penetrate the perimeter. Security operations teams lack the complete, visibility-enhancing, and automated technology to both see and respond to these advanced threats. Current patchwork defenses create more work and unnecessary complexity to secure your enterprise. Multiple exercises highlight how human attackers and malware behave differently once inside your network. Each successful step helps an attacker/malware stay quiet, reducing digital "noise" that might otherwise give them away. Knowing what attackers desire creates an opportunity for an active defense. The Fidelis Elevate platform dramatically improves the effectiveness and efficiency of security operations by delivering comprehensive visibility, intelligent deception, automatic alert validation, and increased response across network and endpoints. The Fidelis Elevate platform is engineered for visibility and designed for response against today's advanced and evolving threats. Increase efficiency of security analysts by reducing response time from hours to minutes per incident. Increase effectiveness from native visibility and multiple defenses in one unified platform. Lower cost of operations via automation within response stages and pre-staged evidence. Risk reduction and protection of data, business operations, and brand.